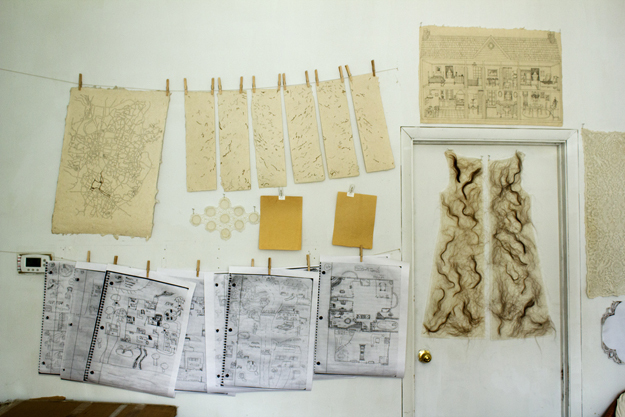 Brenna K. Murphy is a Philadelphia-based artist whose work frequently explores ideas of home, memory, and domestic objects. 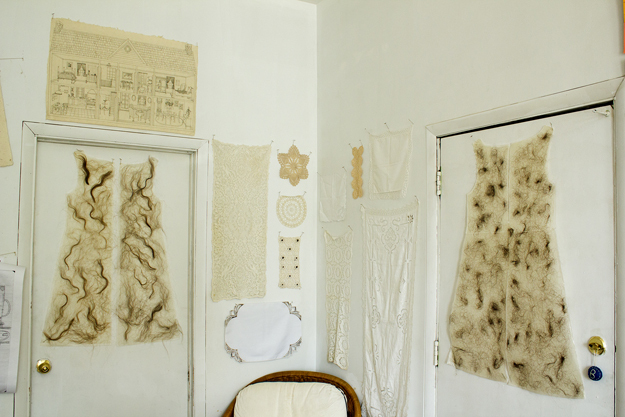 She investigates the personal and collective nature of these themes using mostly her own hair as the medium. I speak with her about some of the pervasive themes and methods used in her work, and her curatorial debut at the University City Arts League. Evan Laudenslager: You talk about “Home” as not only a physical place but also an ephemeral idea that serves as an emotional anchor. How is your work a reaction to this and to your personal experiences? Brenna K. Murphy: I think the concept of Home is very much defined by both its material, physical spaces as well as the more ephemeral, emotional constructs we tend to associate with what it means to feel “at Home” in these spaces. There’s a certain amount of weight that the physicality of a house, neighborhood, city, state, and/or country brings to our experience of Home – I think we identify with these places, and in some way they can become a part of who we are over time. We also infuse physical spaces (our house, our block, our neighborhood) with our loves, our memories, our triumphs and tragedies. Knowing exactly where the creaks in the floorboards are located becomes a subtle reminder that you belong somewhere, that you have a place in the world. My work is an exploration of how these two aspects of Home – the physical and the ephemeral – interact. I’m curious about the nature of that relationship and how it informs our understanding of what Home means, from childhood into adulthood. Growing up a bit of a nomad (living in nine houses in six different states by the age of eighteen), I spent a lot of time grappling with the absence of the physical aspects of Home – no single house that I grew up in, no “hometown” to claim as my own. I believe that this helped me create a special relationship with my hair, which is the primary medium I use in my work. Because of the absence of the material aspects of Home in my life, I came to view my body – particularly my hair – as a surrogate Home of sorts. Over time, this awareness of my body’s consistent materiality replaced the sense of the physical, geographical Home that I was missing – for me Home became where the hair was. My work over the past decade has been an exploration of the merits and failures of this psychological process. It questions how much one needs the physical, geographical aspects of Home in their life to feel complete. I think it’s a particularly relevant question as our culture becomes more and more nomadic. Our increased ability to move easily from one place to another (for school, jobs, family, or relationships) will certainly affect our collective cultural notion of what Home means in the future. Although my work does come from a very personal place, I like to think that I’m a part of this larger conversation as well. EL: How is the relationship between the physical and the immaterial carried out in your imagery? BKM: In a direct way, my use of furniture and domestic objects (irons, frying pans, jars, etc.) references the physical aspects of Home – indeed, these are the physical objects with which we fill our houses to make them Homes. Because of the complex and entangled relationship between the physical and intangible aspects of Home, images of domestic furniture and objects can evoke both personal and cultural connotations. The four-poster bed might remind you of the one you slept in as a child, the 1950’s-style mixer could conjure up images of the American ideal of happy domestic life. In working with such familiar imagery, I can simultaneously reference the physical world and the ephemeral realm of emotion and memory without even trying. The viewer brings their past experiences and associations to the images depicted in the work. Domestic imagery is particularly evocative in this way because the physical and immaterial are so much intertwined when it comes to our experience of Home. EL: You choose to use impersonal imagery in your embroideries, even when reflecting on very personal experiences. You also repurpose found objects – such as other people’s family snapshots – rather than using your own. Are these choices driven by a desire to protect yourself, or do they serve a more involved purpose? BKM: I don’t know that these choices were ever intentional or for personal protection. I think the reasoning behind the omission of personal furniture and objects is a bit more mundane. I begin my initial drawing process with tracing, sourcing images from home and lifestyle magazines and books about furniture. In this way, the choices about which images to work from are purely logistical. I admit that my own family snapshots are precious to me, and I’m uneasy with altering them for my art. My parents took great care in compiling them into albums, and I think it would be disrespectful of me to disrupt that. I view these albums as works of art by themselves, and they are valuable for preserving our family history. In the “Found” series, I intervene in the discarded family snapshots of strangers with my hair, and it was a conscious, conceptual decision not to use my own family photos. I wanted to insert myself into the domestic lives of strangers, lives that I imagined contained something unattainable in my own life: a sense of stability and deep connection to the domestic environments in which the photos were taken. It was my way of imagining what that life would be like, and also a way to poke fun at myself for my unreasonable longing for the domestic experiences of others. EL: Your medium of choice is your own hair. What separates its materiality and process from any other medium? BKM: Hair is a truly interesting medium, full of its own surprises, benefits, and challenges. I began my artistic career as a photographer, and started using my hair because I wanted to explore my life-long habit of obsessively smelling and playing with its tips. 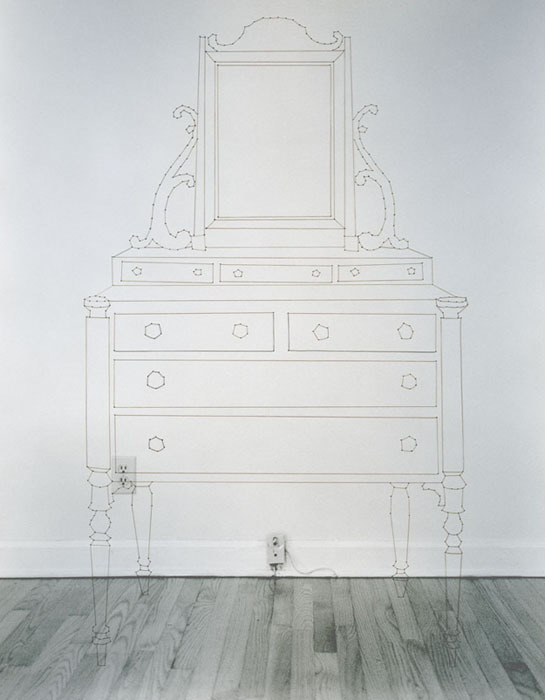 I found my voice by embroidering images of furniture into black and white photographs of empty houses, creating “Home is where the Hair Is” (2004). After that, a door opened for me, and the hair just took over – ten years later I am still working with it! I find it a fascinating material because it elicits such intense (and often visceral) reactions in the viewer. Everyone has their own experiences with hair – desiring it, managing it, losing it, hating it, loving it – and they bring these associations to my work. In this way, although it’s very clearly rooted in the physical world, hair easily evokes the immaterial realm of emotion and memory. EL: How did you approach your curatorial debut while putting together “Home” at UCAL, and how did your work function with artists who approach similar topics in different ways? BKM: Part of my goal for the show was to bridge the gap between the sometimes disparate art scenes of West Philly and neighborhoods east of the Schuylkill. 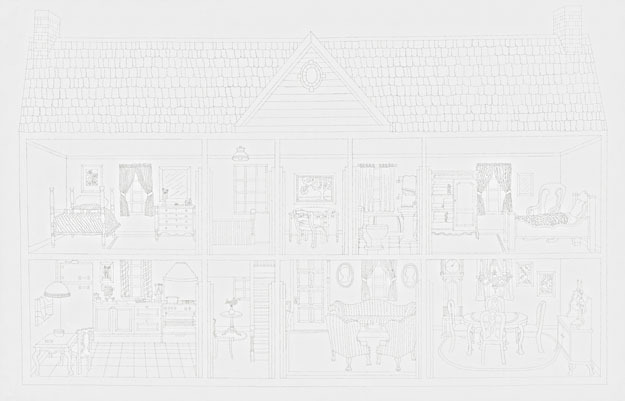 After researching several possible venues in the neighborhood, I landed on UCAL: a community art center located in an old Victorian-era house, the perfect setting for this exhibition about Home and domesticity. I immediately thought of Kay Healy and Emily Manalo Ruiz – they both live outside of West Philly and, more importantly, our works share thematic and aesthetic elements that I knew would gel into a compelling exhibition. It was a very organic process that I really enjoyed, and although I was responsible for the overall vision of the show, I feel the installation of the works was a true collaboration between the three of us. I think visual artists have an intuitive understanding of how their work will best display in the gallery. It is important to acknowledge and respect this as much as possible. Kay, Emily, and I are all interested in the inherent materiality of home: we investigate domestic furniture and objects, textiles, everyday artifacts, and the human bodies that occupy our homes in an effort to understand how these aspects of the physical world effect the intangible realm of human psyche and emotion. We all employ ‘domestic crafts’ (traditionally ‘women’s work’), like embroidery and sewing, so both the process and the final products reference the concept of Home and domesticity. I also think there’s a nice ebb and flow between works that are bolder and bigger, like Kay’s “Coming Home: Bathroom” installation and Emily’s series of printed salvaged textiles, and the more subtle, quieter works like my installation of hair-embroidered envelopes, “Post (Nomad).” Both the differences and similarities of these works compliment each other, and create a unique visual conversation about what Home means to us from a variety of perspectives, both personally and in a larger, cultural sense. Home: featuring work by Kay Healy, Brenna K. Murphy, and Emily Manolo Ruiz at the University City Arts League, on view through July 20th. Evan Paul Laudenslager is an artist and writer based in Philadelphia. He is a recent graduate of Tyler School of Art.